EBS 5.0 helps you to Set up valuable relations with your customers and maintain effective relationship using flexible automated sales processes. 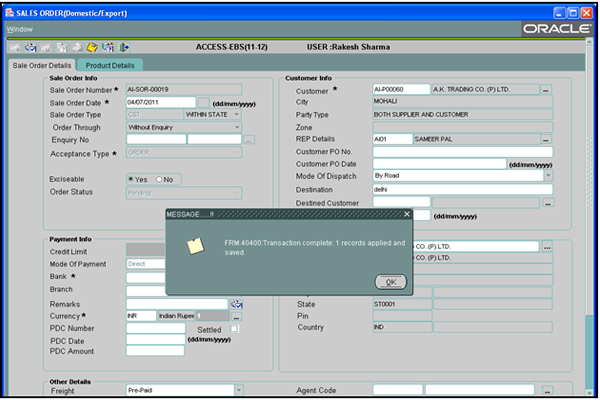 Sales Order is created to represent the customerâ€™s requirement in the system. That will calculate the price and check for the availability of materials. Perform Invoice can be created in order to inform the customer about the value of the goods, so that he will make arrangements for the payment to be made, when goods arrive at his place. 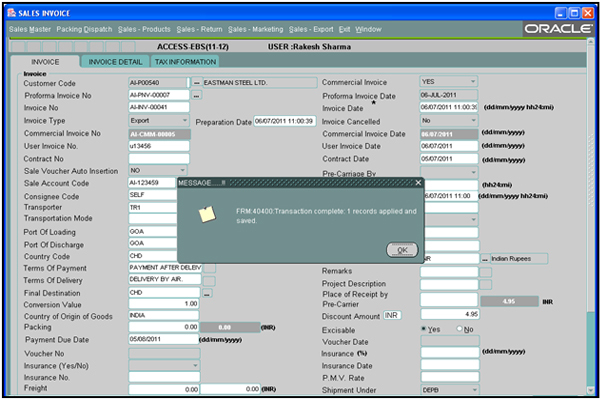 Dispatch Advice, Packing list, Excise, Custom Invoice, Shipment Details.ARE-1 document is created with reference to generated outgoing Excise Invoice. Enquiry handling is used to enter the detail of enquiry received from prospective clients. Enquiry Approval this form is used to accept or decline the enquiry. Enquiry Follow-ups used to enter the details of follow ups done with prospects. Quotations is used for sending the quotation for the enquiry. Order booking is for entering the SO received from client after enquiry get matured. 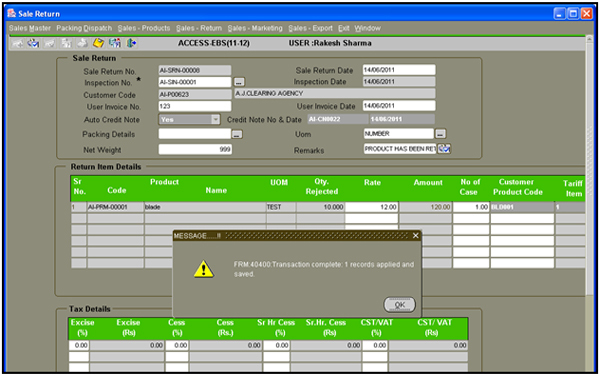 An order for Material is used to enter the Sales order received from customer. Sales Orders Approval used to Approve/accept the SO. 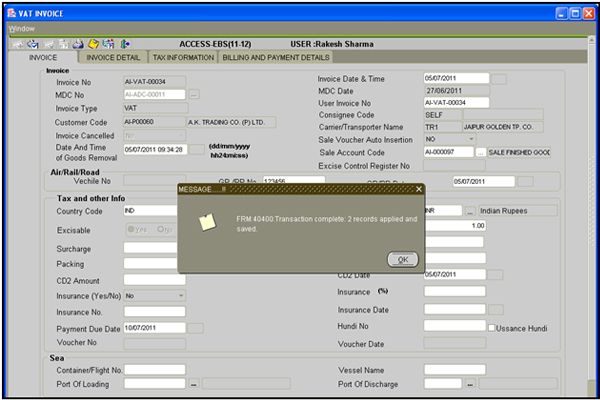 Sales Schedule form is used to enter the delivery schedule given by clients against any SO. 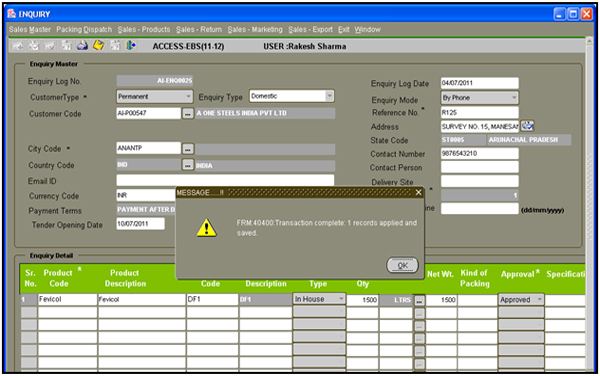 Dispatch Advice is used to enter the dispatch advice after the required product has been manufactured and FG updated. Gate entry – Starts with gate entry. Inspection â€“ After GE the goods are inspected. Rejection goods store â€“ RGS stock is updated. Rework Register â€“ The rework able material is reworked and left over is rejected. Sales Return is used to send the material after rework.